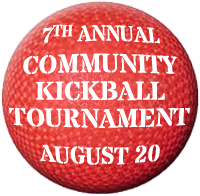 Join us for a day of fun, friendly competition, charity and kickball! Get together with your friends, family, co-workers, employees, club members, and whoever else to benefit the Community Foundation of Southern Maryland, helping to make our community the best place to live and give. Sunday, August 20, 2017, 2 p.m.
For more information, send an email to donorservices@cfsomd.org or call 240-670-4483 (GIVE).